This tool gives you extra controls to manipulate the currently selected note and its properties. It is useful for visual feedback and fine adjustments of values via the mouse. This can be assigned via the renoise preferences, found in the renoise edit menu. -The GUI updates as you move about the pattern. Row 2: Rotary sliders for changing vol/pan/delay column values. Also nudge buttons for the delay value that will shift the note up or down a row when min (00) or max (FF) values are reached. This will move the note to the first available column on the new line. 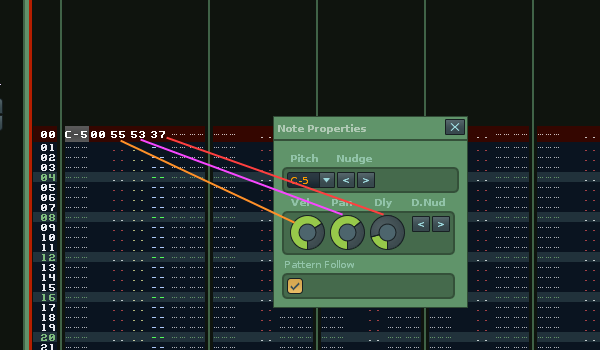 Row 3: Allows you to set pattern follow behaviour, so when you are looping and want to change values you can switch pattern follow off easily. Renoise already provides a default shortcut for this function if required.